I’ve been seeing more and more articles like this one from Computerworld about abandoning SQL databases. The meet-up in San Francisco last month had a whiff of revolution about it, like a latter-day techie version of the American Patriots planning the Boston Tea Party. The inaugural get-together of the burgeoning NoSQL community crammed 150 attendees into a meeting room at CBS Interactive. 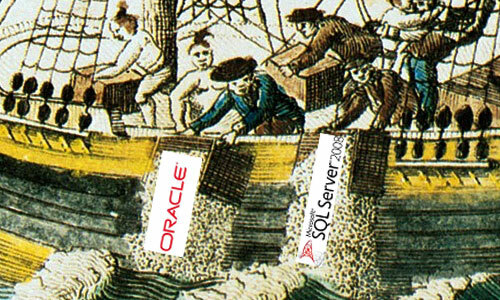 Like the Patriots, who rebelled against Britain’s heavy taxes, NoSQLers came to share how they had overthrown the tyranny of slow, expensive relational databases in favor of more efficient and cheaper ways of managing data. NoSQLers? Oh boy are we going to be in for it when they hear how critical databases are for the geospatial industry. To me this “revolution” sounds more like a backlash against the traditional SQL DBA who doesn’t want to change in the face of “Web 2.0”. Of course it is very easy to move to a new data storage platform when you either have a ton of money or no product yet. While I do think technology such as Google’s BigTable and Amazon’s SimpleDB as an inevitable course for many web applications, wholesale abandonment of SQL and databases such as Oracle/SQL Server/PostgreSQL is absurd.